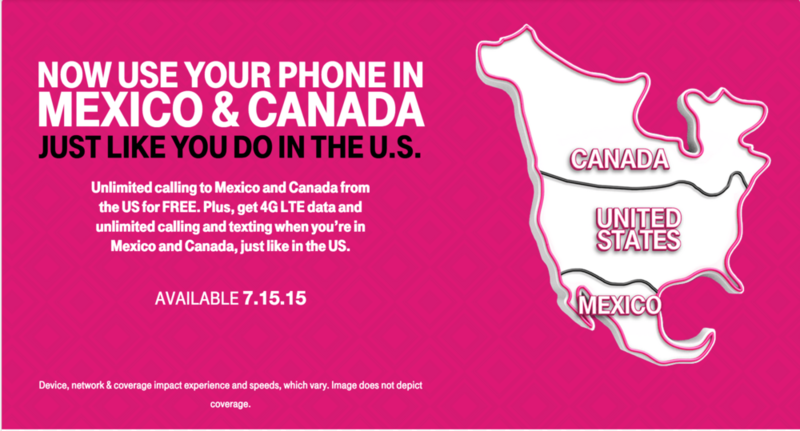 DEAL: T-Mobile to Cover Canada & Mexico with NO Roaming Fees! — Future Proof M.D. DEAL: T-Mobile to Cover Canada & Mexico with NO Roaming Fees! T-Mobile (the nation's 4th largest wireless carrier) has been pushing the boundaries of the wireless industry since its first "Un-carrier" initiative in March 2013. Now you have yet another reason to choose the Big Purple as the service provider for your new smartphone - starting 7/15/2015, you will be able to use your T-mobile smartphone in Canada and Mexico just as you would in the USA - NO Roaming Fees! Essentially your US plan becomes a North American plan. You can read more about the new offer here.